Meena Bazar is a well-known retail chain superstore in Bangladesh maintaining all International standards like Carrefour. It started its journey in 2002. Every Meena Bazar outlet carries almost 6,000-8,000 products to sell. Meena Bazar is a subsidiary of Gemcon Group. It also produces organic products, dairy items, prepared food & herbal products. 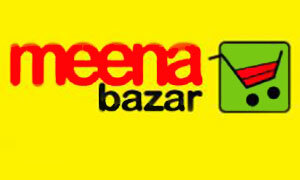 Meena Bazar is the first retail superstore in Bangladesh that has a website to shop online. Meena Bazar is also known as one of the trustworthy food suppliers of the nation. Meena Bazar is committed to deliver the best available products to the customers and is now expanding more to serve Bangladeshi customers better. Plot No. 26/27, Adarsha Chhayaneer Housing Society. 19, Larmini Street Wari, Dhaka.